When urban consumers start to think in earnest about their food, from the way it is grown to how they can access nutritious and safe supplies, then it can lead to a transformation in the way the food system operates. No longer able to access nutritious food that is free of pesticides and chemicals, consumers have been casting about them for alternatives. While some have settled for organic food available in supermarkets and niche outlets, a group consisting of 100 consumers from Hyderabad have decided to try a different route. They believe that the farmer has to be the centerpiece of the new paradigm, and that a direct link with producers alone, will guarantee nutritious supply. After years of debate, the group, which is part of the Hyderabad-based Disha consumer movement that promotes ecological farming, has decided to provide direct monetary support to farmers who have been practising traditional millet-based biodiverse agriculture for decades. In return, consumers will get an agreed quantity of grains after the harvest. The beginning of this mini-revolution was initiated in mid-June this year at a hamlet in Telangana’s Sangareddy district, some 120 kilometres from Hyderabad. 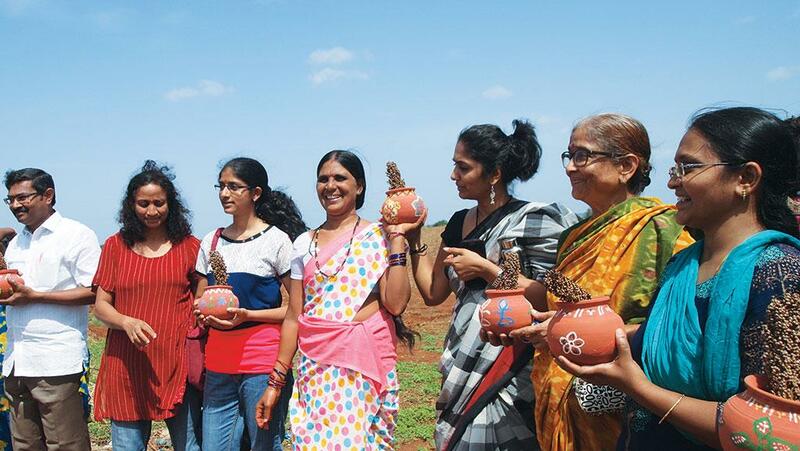 A group of enlightened consumers descended on tiny Arjun Nayak Thanda where women farmers dressed in vibrant traditional attire greeted them. It was a meeting of two different worlds that knew little of each other, but were palpably caught in the excitement of a joint enterprise that had brought them together. The philosophy underpinning this unusual partnership is the belief that Indian agriculture needs to go beyond the organic. Disha convenor D Satya-narayana Raju says that after working for over a decade on the concept of healthy eating, first in Pune and then in Hyderabad, he felt the movement was missing something critical. “We started with organic and focused on the individual health of consumers. Like so many other organisations we too overlooked something basic: a more sustainable form of agriculture for a better society and came to the conclusion that food had to be viewed in a larger context.” Disha brings together consumers who want to look at food in a holistic manner starting with sustainable production. It is a lofty ambition that has made a small beginning in community supported agriculture (CSA) in India. CSA is a concept in which consumers share the responsibilities, risks and rewards of farming. Beginning in the 1970s in Japan and Switzerland, it is now spreading in the US and some European nations. Vegetables and fruits, along with dairy products and meats, are the products most favoured in CSA which is a way of fostering a close bond between farmers and their immediate community. In some cases, consumers offer their labour in exchange for fresh produce. Raju’s collaboration with the Deccan Development Society (DDS), a non-profit based in Sangareddy, helped sharpen his ideas on the way forward. DDS has been working for over three decades on promoting millet farming that relies on the traditional knowledge of farmers, specially women food producers, to spread the message of food security for cultivators and good health for urban consumers. 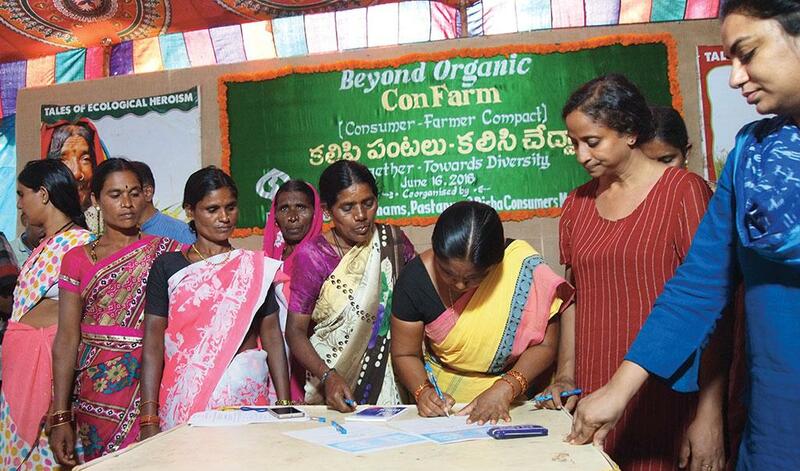 Together with DDS, Disha named the project Beyond Organic, the ConFarm (consumer-farmer compact). P V Satheesh, DDS director, describes it as “a holistic partnership between ecological food producers and enlightened consumers who are aware of the deep crisis in Indian agriculture”, and hopes it will change the current dynamics of farm production and the market. DDS works in 55 villages where sanghams (collectives) of women farmers have been set up to strengthen their way of life and farming. In all, 83 hectares (ha) have been selected for ConFarm in Arjun Nayak Thanda and five adjoining villages in Sangareddy, and agriculture in these parts present the kind of challenge that urban folk would find daunting. The majority of farmers here are women with plots as small as 0.4 ha. For decades, they have been growing millets such as jowar and bajra to lesser known varieties (barnyard millet), along with dozens of other crops, like lentils and oilseeds. Bullocks are used for ploughing and there is no mechanisation of any kind. There is no irrigation facility either and the farmer is dependent on the timely arrival of rains. Last year, the harvest was affected by the late rainfall and also by birds feeding on depleted crops. While the 100 consumers have contributed Rs 12,500 to Rs 25,000 each for this season, DDS joint director Jayasri Cherukuri says farmers will get support of Rs 10,000 per 0.4 ha. Grains of equivalent value will be given to the consumers as each crop is harvested. (This article was first published in the 1-15th August issue of Down To Earth under the headline 'Consumers discover the farmer').